This weekend at the DGA Theater: Flights, drone, action! This weekend, Manhattan will play host to what sounds, on paper, like a guaranteed “fly” event: the city’s first-ever Drone Film Festival. “I bought this thing called a DJI Phantom. It’s the iPhone of drones,” he says. “I had hours and hours and hours of footage around New York, and I finally decided to edit it.” Slavin put the film online and within the next couple of days, received calls from Fox News, Time magazine, Mashable and Gizmodo. The selection of short films (all under five minutes) will screen Saturday night at the Directors Guild of America Theater on West 57th Street. 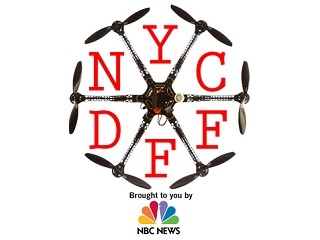 Then, on Sunday at Vaux Park, folks are invited to bring along their drone and participate in a “fly-in.” The panel of judges that helped Slavin select prizes includes NY1’s Pat Kiernan and NBC News’ Janelle Rodriguez. If you can’t make it to the event, may we recommend this very affordably priced official poster and last fall’s New York magazine feature on the drone scene by Benjamin Wallace-Wells.